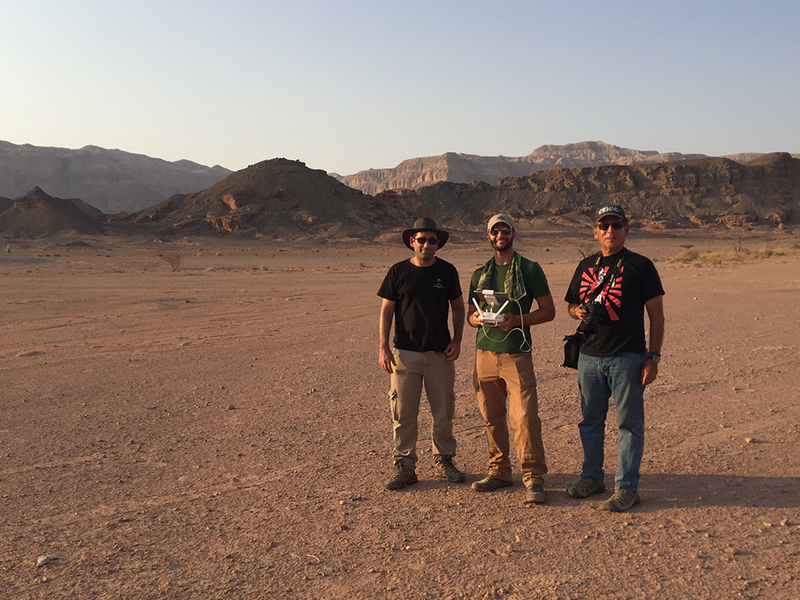 UC San Diego Anthropology alumnus Dr. Erez Ben-Yosef (Tel Aviv University), Anthropology graduate student Tony Tamberino and Prof. Thomas Levy flying drones in the Timna ancient mining area of southern Israel. A team of archaeologists from the University of California San Diego and two leading Israeli universities has wrapped up a three-week expedition to document two major sites in Israel using the latest in 3D scientific visualization technologies. The expedition, led by UC San Diego Department of Anthropology professor Thomas E. Levy, involved a land-and-sea approach to understanding trade and exchange during Biblical times, at sites dating to the Iron Age, circa 1200 to 586 BC. 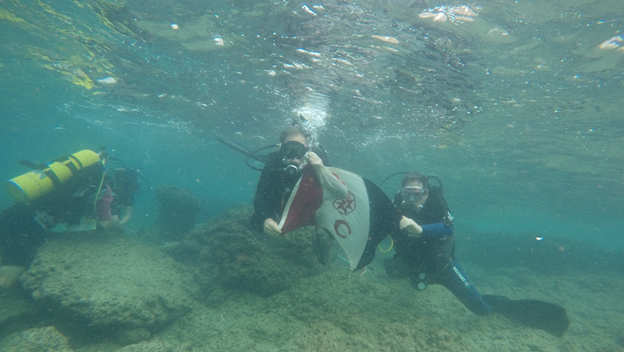 Officially sanctioned by The Explorers Club, the expedition carried Explorers Club Flag #179 to the ancient mining region of Timna in southern Israel as well as to Tel Dor on the Mediterranean coast, the site of a submerged port facility. 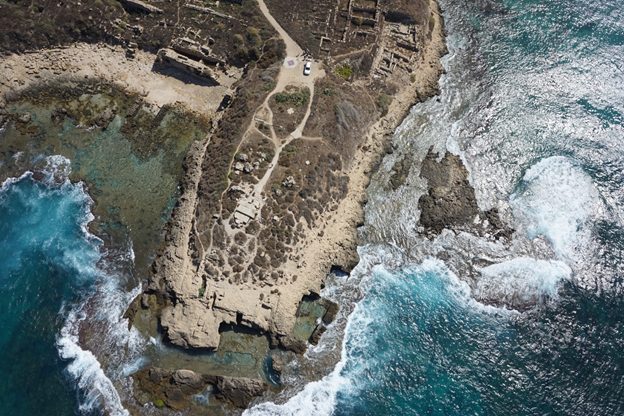 “Between the two sites, we captured more than 24,000 high-definition photos for use in creating 3D computer models of these two very historic areas,” said Levy, who directs UC San Diego’s Center for Cyber-Archaeology and Sustainability (CCAS), based in the Qualcomm Institute, and co-directs the Scripps Center for Marine Archaeology (SCMA). “Back in San Diego, we’ll be processing the images to build large-scale virtual models to help archaeologists and students better understand the two historically important regions in Israel and how they were united in antiquity through the copper trade." Levy’s co-principal investigators on the expedition included University of Haifa professor Assaf Yasur-Landau in the Department of Maritime Civilizations, and UC San Diego alumnus Erez Ben-Yosef (Ph.D. ’10), who did his doctoral dissertation with Levy and is now a professor of archaeology at Tel Aviv University. Ben-Yosef organized the logistical infrastructure of the Timna imaging projects, while Yasur-Landau organized the 3D Tel Dor imaging project through his Laboratory for Coastal Archaeology and Underwater Survey, with support from former Scripps Institution of Oceanography postdoc Tali Treibitz from the University of Haifa's Marine Imaging Laboratory. Treibitz facilitated the underwater data collection in the waters of Dor. Also helping to make the expedition a success were CHEI director Falko Kuester for student support and the allocation of processing resources and equipment to the project, as well as researcher Eric Lo for image processing. The UC San Diego team included Christian McDonald, scientific diving safety officer at Scripps Institution of Oceanography, Department of Anthropology graduate student Anthony Tamberino, as well as Dominique Meyer, a Ph.D. student in the Department of Computer Science and Engineering and researcher in the Cultural Heritage Engineering Initiative (CHEI). Meyer and Tamberino were responsible for the provision of equipment and data collection of aerial and ground-based 3D images. Meyer also served as the primary drone operator and flight planner for the expedition, for which he operated Phantom 4 drones with standard 20-mm cameras as well as directing a heavy-lift drone octocopter for video and structure-from-motion (SfM) photography with 36-megapixel cameras operated by the Griffin company. The logistics of the project were greatly supported by the Israel Antiquities Authority whose own drone operator, Yitzhak Marmelstein, worked with the team for the duration of the project. 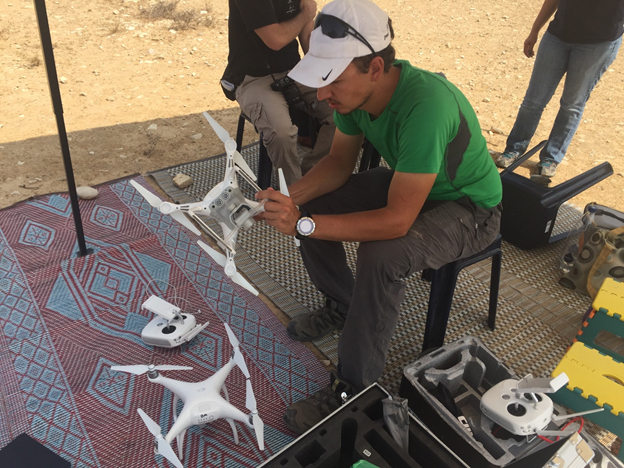 CSE Ph.D. student Dominique Meyer adjusting Phantom 4 drones before flights over Shiqmim and the Wadi Beersheva. (Photo courtesy T.E. Levy, Scripps Center for Marine Archaeology and Center for Cyber-Archaeology and Sustainability, UC San Diego). 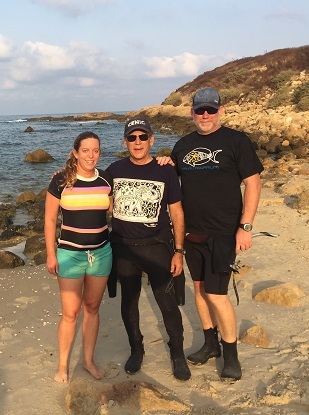 Levy (center) with former Scripps postdoc Tali Treiblitz (left) and Scripps' diving safety officer Christian McDonald. The aerial drones carried out regional 3D scanning of more than 15 major ancient sites related to copper mining and smelting in the Timna mining region, including at Shiqmim in the northern Negev desert. In Shiqmim, Levy had previously excavated Copper Age ruins, including an ancient 24-acre village dating to the Chalcolithic period (ca. 4500 – 3600 BC), when copper was first smelted and cast in the southern Levant. To capture the submerged port facility at Tel Dor, the team used scuba and high-precision underwater cameras to image remains of the ca. 9th century BC port. The Israel 3D Land and Sea Project 2017 was generously funded by Marian Scheuer Sofaer and Abraham Sofaer of Palo Alto, CA.. In addition to the 3D imaging project at Tel Dor and Timna, the expedition laid the groundwork for the first UC San Diego-University of Haifa Marine Archaeology Field School, tentatively planned for July 2018.